TravelsinTaste.com recently visited the newly opened Palazzo in Las Vegas and had the pleasure of meeting Executive Chef Eric Bauer from Morels French Steakhouse & Bistro, one of the first restaurants to open in the $1.8 billion hotel-resort-casino. Chef Bauer shared with us his feelings on the Las Vegas dining scene, his thoughts about current and future culinary trends, and even his tastes when it comes to cooking and unwinding in his free time, of which he hasn't had much lately thanks to the demands of opening a brand new Strip-side restaurant. We also enjoyed a meal with Chef Bauer, during which he discussed the restaurant and its most popular dishes in tantalizing detail. To read about this mouthwatering experience stay tuned, we'll post it soon! The full listing for Morels is coming soon also. Please read on and enjoy! 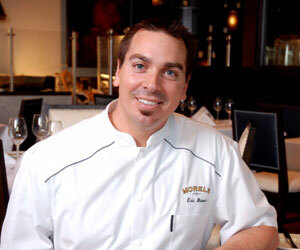 Chef Bauer has spent many years honing his craft, both domestically and internationally. We therefore thought it would be interesting to hear his take on the world-class Las Vegas dining scene. "I think Las Vegas, hands down, is a culinary Mecca now," he says. "There's no more of a phase; it’s the Mecca. I read an article that it was the most expensive place to eat in the United States, which is not great in a way, but it just shows you what big names are coming here, what people are bringing to the restaurants here. For me, whenever I talk to anybody, I like to tell people that we're here to compete with all those guys with all those big names. While not the only difference, a significant difference is that those big names have big-name restaurants; I'm here every day and they are not. It's very important for me to be at the restaurant. I love to be at the restaurant. I love to talk to the people." Speaking with his clientele is something that Chef Bauer does very well. In fact, he's designed the restaurant to be interactive so that he can do just that. From the tableside preparations to the Macaroon Cart, the restaurant is extremely hands-on. Chef Bauer takes pride in that and can frequently be found in the dining room chatting with his customers. As a matter of fact, he recently had a lovely customer experience. "I had a great guy in the restaurant the other day," he recalls. "He was celebrating his 80th birthday. He was with his son and his business partner; they were a couple of gentlemen from El Paso, Texas, and talked about how they started their business there. They owned grocery stores. He was just very surprised at the food here, and that after a short amount of time of the restaurant being open there was such great attention to detail. He was a very nice gentleman and very willing to give out advice, such as, 'You have to think outside the box,' and, 'You don't have to be like everyone else.' It was quite touching to see this gentleman after 80 years; obviously he's a very successful gentleman, and because he runs supermarkets he knows the business and the fresh produce and all that goes with it. It was a great compliment after being open for such a short amount of time that he felt this was one of the best dining experiences he's ever had."